Henrietta Mears - This is a personal letter written by the apostle Paul to a young minister whom he had left on Crete. Like the Timothy correspondence, the letter to Titus is practical and discusses the everyday problems confronted by a young church leader. The importance of good works is stressed in this epistle. Not that we are saved by good works, but that we are saved for good works. Here also God presents His ideal for the Church and its officers and members. The epistle to Titus was written by Paul. Titus was bishop of Crete, a hard post (see Titus 1:12–13). Paul had given Titus a difficult task before, that of settling the differences at Corinth and tactfully persuading the Church to do the right thing in the matter of divisiveness. Paul’s second letter to the Corinthians shows how successful Titus was in this mission. Titus was a Gentile. No doubt he was one of Paul’s converts during the early years of the apostle’s ministry. He accompanied Paul and Barnabas to Jerusalem 17 years after Paul’s conversion. When Paul heard that Apollos was about to go to Crete, he took the opportunity to send this letter to Titus (see Titus 3:13). It is full of practical advice to the young pastor, giving him directions for church administration and warning him against the heretics of his day. He asks Titus to come to him and to report about the condition of the church on the island. Although this is a personal letter, it undoubtedly was meant to be read to the church also. The letter is very much like Paul’s first letter to Timothy, being written about the same time and dealing with the same subjects. James Van Dine - Sound doctrine, applied and promoted by spiritual leadership, produces good works unto the adorning of the gospel of Christ....Paul’s greeting adds “servant” to the usual “apostle” thus making the focal point of his service the preaching of the Word. 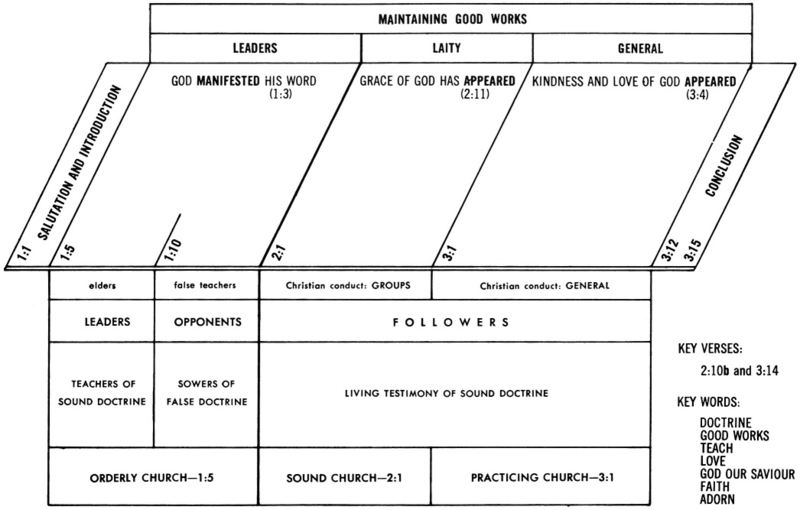 Sound doctrine will be the basis for Titus’ instruction, which has a view to a life of good works (cf. Titus 1:9; 2:1, 10)....The theme of good works ties this letter together (Titus 1:16; 2:7, 14; 3:1, 8, 14). When the assembly is properly ordered (1:5) and dutifully instructed (1:9) then good works will be promoted and Jesus Christ will be glorified....Good works can never be divorced from sound doctrine, and sound doctrine must be held and promulgated by sound leadership. THE NEW TESTAMENT CHURCH: Here is a fine picture of the New Testament church in its full-orbed realization in the community as an organization. Many boast today that they belong to a New Testament church. In this epistle is found the measuring rod. The ideal church is one that has an orderly organization, is sound in doctrine, pure in life, and “ready to every good work” (Titus 3:1). THE RETURN OF CHRIST: In the first two epistles that Paul wrote (1 and 2 Thessalonians), the return of Christ is a great pulsing hope. This has led some critics to say that Paul believed this only when he was young and that he changed when he became more mature. However, in this epistle to Titus, one of his last, the blessed hope still possesses the soul of this intrepid pioneer of faith, “Looking for that blessed hope, and the glorious appearing of the great God and our Saviour, Jesus Christ” (Titus 2:13+). The word for “looking” (prosdechomai) has the root meaning of entertaining. This is the hope that occupied the guest chamber in the heart of Paul during all of his life, beginning at the Damascus Road and going on to the Appian Way. Hiebert - ALTHOUGH one of Paul's intimate friends, Titus is never mentioned in the Acts. All that we know of him must be gathered from the references to him in the Pauline epistles. His name occurs only thirteen times in the New Testament, nine times in 2 Corinthians. Yet these scanty notices give us an attractive picture of the young man to whom Paul addressed the Epistle to Titus. He is seen to be one of Paul's devoted companions and a capable and trusted worker for the Lord. It is a testimony to Paul's practical wisdom and foresight that he drew into association with himself such young men as Titus and Timothy in the work of the Gospel. One of the purposes of the epistle was to provide Titus with the needed written authorization for his work on Crete. Paul was aware that, having been left there as his representative, Titus would encounter opposition in carrying out the instructions given him. Some would despise him, as implied in the admonition, "Let no man despise thee" (2:15b). Others would openly reject him. This may be assumed from the explicit statement at the opening of the epistle that he had been left there to order the affairs of the churches (1:5), as well as from Paul's strong words about the false teachers: "whose mouths must be stopped" (1:11). The epistle, then, was intended to strengthen Titus personally and to arm him with apostolic authorization for his work "by placing in his hand written instructions to which he might be able to appeal, whenever the occasion should arise, in proof that he was not acting arbitrarily, but in accordance with positive Apostolic directions." The epistle was further intended to provide Titus with specific instructions concerning his work in the churches. He is enjoined to appoint elders in the various churches who have the necessary moral and doctrinal qualifications (1:6-9), and this is urged as all the more important in view of the work of the false teachers there (1:10-16). He is also urged to insist on the need for sound teaching and a high type of moral living on the part of Christians (2:1-10; 3:1-3). This demand for consistent Christian living must be grounded in a personal faith in the basal truths of the Gospel (2:11-14; 3:4-8). 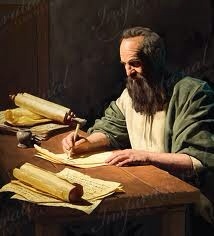 Writer is the Apostle Paul; the place, Macedonia about A.D. 65. Titus was one of Paul's trusted helpers. He was a Greek, possibly a native of Syrian Antioch. He was used largely in Paul's ministry to Corinth (II Corinthians 2:13; 7:6; 8:23). Evidently on Paul's release from his first Roman imprisonment, Titus joined him. Soon Paul left him to stay in Crete (Titus 1:5) while he, Paul, went on to Macedonia. While in Macedonia Paul wrote this letter along with the first letter to Timothy. We last hear of Titus (II Timothy 4:10) as Paul sends him to minister to the churches in Dalmatia (N.W. coast of Greece). second, to correct churches who had become lax as to the order of GOD's house. Here is the divine order for churches of all times. The qualifications and functions of an elder (1); the pastoral work of a true elder (2; 3). It is possible that the church in Crete was founded by one of the converts from the day of Pentecost (Acts 2:11). Also, it is implied that Paul himself had visited and evangelized on the island. The Cretians were thought to be akin to the Philistines. They were daring sailors and famous bowmen but with a very bad moral reputation. In Paul's day many Jews lived there. The degree of civilization in Crete was not too high. One of their own poets called them "liars, evil beasts, slow bellies." But Paul felt sure the power of the Gospel could transform lives there too. Evidently Paul did not purpose that Titus should settle down permanently in Crete but that he might be relieved by either Artemas or Tychicus, for he instructs Titus to meet him at Nicopolis (Titus 3:12) where he intended to winter. The terms "Elder" and "Bishop" are synonymous. One emphasizes the person and the other the office. Very strict and rigid qualifications are required, for this is a most important office in the Church of the living GOD. The problem of false teachers is again dealt with (Titus 1:10-16) with the term "whole houses" meaning whole churches. The mouths of the unruly and deceivers were to be stopped by a vigorous proclamation of the truth. Strong emphasis is given here on "good works," not as a means of salvation, but as an evidence. (See Titus 2:7; 2:14; 3:1; 3:8). The power of beautiful lives is shown to be a complete answer to the critics of the Gospel Titus (2:8). Here is the place in the New Testament where the rapture of the church is spoken of as "the blessed hope" (Titus 2:11-14), and is a compelling motive for godly living. The "genealogies" referred to evidently concerned false teachers seeking to prove Davidic lineage, or to claim kinship with CHRIST. 7. KEY: Put yourself in Titus' place as a pastor laboring under difficult circumstances. This letter is instruction from your teacher. The Epistle to Titus follows that of I Timothy in order of composition. After writing the last-named Epistle, Paul sailed with Titus to Crete where he left him to set in order the unorganized churches. Titus, a heathen by birth (Galatians 2:3), was probably one of Paul’s converts (Titus 1:4). He was present with the apostle at the council at Jerusalem (Acts 15), where, in spite of the insistence of the Judaizers, Paul refused to circumcise him (Galatians 2:3). The apostle had great confidence in him and entrusted him with important missions (II Corinthians 7:6, 7, 13-16; II Corinthians 8:16-24). An appeal to the church to be true to Christ. Titus: Truth and Proof - Ray Stedman - "The Bible without the Spirit leads to a dead, institutional Christianity. The Spirit without the Bible leads to groundless fanaticism. We need both the Spirit and the Word to effectively Adventure through the Bible." McClintock and Strong's Bible Encyclopedia Titus, Epistle To. James Rosscup writes that Alford's series on the New Testament "contains much that is valuable in the Greek New Testament...though all of the Greek New Testament words have been changed to English throughout." (Commentaries for Biblical Expositors: An Annotated Bibliography of Selected Works). C H Spurgeon wrote that Bengel's NT commentary "is the Scholar's delight! Bengel condensed more matter into a line than can be extracted from pages of other writers." Titus 1 - 43 pages of resources! Titus 2 - 100 pages of resources! Titus 3 - 60 pages of resources! D Edmond Hiebert - Westminster Commentaries. London: Methuen & Co. (1917). A concise, conservative, phrase-by-phrase interpretation by a missionary in India who understands the positions of Timothy and Titus in the light of his own missionary experience. D Edmond Hiebert - The introduction adequately treats the critical problems from a conservative position. Full and informative notes on the text; valuable appendixes. 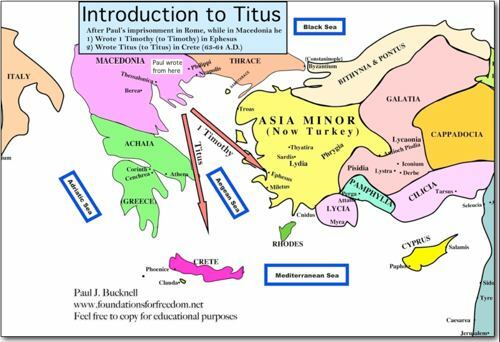 "Designed for Pastors and Sunday Schools"
Titus - What Do We Know About Titus? Titus - What Do We Know About Crete and the Cretans? Titus 1:5 Who Runs This Church? Tom Nettles, et al authors. Titus 2:7-8 Are You the Real McCoy? James Rosscup - Favoring authorship by Paul (30–32), Towner provides a succinct, lucid commentary that sometimes explains verses or parts of them, sometimes ignores things (as “especially those who believe,” 4:10; “save both yourself and your hearers,” 4:16; or 2 Tim. 4:8, where the words do not really resolve Towner’s idea that a faithful life is necessary for receiving a crown, final righteousness, with this being of grace and not earned). Overall, the work seems below average, a mixture of being of some help and of little help, this depending on which verse. It will be of mediocre benefit only to those wanting a cursory, yet easily flowing guide. It grew out of Towner’s Ph. D. dissertation under I. Howard Marshall at the University of Aberdeen, Scotland, but does not approach Marshall’s usual kind of serious explanation. D Edmond Hiebert - Lock, Walter, "A Critical and Exegetical Commentary on the Pastoral Epistles." The International Critical Commentary. Edinburgh: T. & T. Clark (1924). Greek text. Lock leans to the conservative view but makes no pronouncements on the vexing critical problems. The notes on the Greek text are rather thin. Not up to the high standard of this series. D Edmond Hiebert - A scholarly, conservative work (published in 1901) giving a comprehensive discussion of the Pastorals as a group as well as the individual epistles. A verse-by-verse exposition characterized by spiritual warmth and practical appeal. Audio Only (Mp3's) - Through the Bible comments in a uncompromising, pithy style. D Edmond Hiebert - Greek text. A full exegetical treatment of these epistles by an evangelical German scholar of the past century (1893). Scholarly and technical, providing references to scholarly views of the authors own times. Note: The comments are in the links to the right side of the Scripture annotation. The words and phrases are based on the KJV. What should we learn from the life of Titus? What does it mean to be above reproach / blameless? Can an unmarried man be a deacon or elder? Titus 2:13 What is the blessed hope? Titus 3:5 What is regeneration according to the Bible? John Cereghin - What a good translation, full defense of the apostolic authorship of the epistles, fruitful comments and profitable dissertations, this volume is as complete a guide to the smaller epistles as one could desire. This old, standard treatment shows how pastors may use the Greek text to aid their exposition. A fine work in spite of its age. Uses Tischendorf's Greek text. Holds that Christ was a substitutionary ransom for sin (117); stresses the divine inspiration of Scripture (379); concludes with three appendixes on problem passages (405ff). Very thorough commentary on the Greek text. Defends Pauline authorship (1- 19); favors view that Jesus Christ is called "our great God and Saviour" (283); attacks the idea of baptismal regeneration (295); has a special appendix on the treatment of slavery in the New Testament (432). D Edmond Hiebert - Uses the Greek text of Tischendorf and the author's translation on facing pages. A voluminous (nearly 450 pages) exposition by a conservative Scottish theologian. Still worth consulting but devoid of the results of recent scholarship. Doctrine is nothing, dissociated from deed. Abstract truth is poor, compared to living principle. Titus 1:2 - LOOK upon all the Lord's covenant dealings with you as but preparatory to your approaching emancipation from all sin, suffering, and sorrow. Welcome your trials—they are sent by your Father. Welcome the stroke of His rod—it is a Parent smiting. Welcome whatever detaches you from earth, and wings your spirit heavenward. Welcome the furnace that consumes the dross and the tin, and brings out the precious gold and silver, to reflect in your soul, even now, the dawnings of future glory. Oh! be submissive, meek, and quiet, under God's chastening and afflicting hand, and receive all His dispensations as only tending to fit you more perfectly for "the inheritance of the saints in light." Let his "hope of eternal life" cheer and comfort the bereaved of the Lord, from whose hearts have fled the loved and sanctified ones of earth, to the eternal heaven. Oh! how full of consolation is this prospect! Where have the departed fled, who sleep in Jesus? They have but exchanged the region of darkness and shadow for the regions of light and glory. They have gone from the scene of impurity, defilement, and sin, to the place of perfect holiness, complete sanctification, and eternal love. Then dry your tears—then press the consolations of the gospel to your sorrowing heart, and look up with that eye of faith that pierces the penetrates the dark clouds that intervene between them and you, and behold them now "partakers of the inheritance of the saints in light." And oh! yourselves anticipate the blessed moment when the Savior shall send, not an enemy, but a friend—for such is death to the Christian—to open the cage that imprisons your spirit, and let you escape to the abodes of eternal glory. Oh! anticipate and, by anticipating, be preparing, day by day, for its realization; anticipate the happy moment which releases you from "the body of sin and death," and ushers you into the full enjoyment of "eternal life." Such is heaven, and such is the consummation of the inner life. As that life descended from God so to God it shall ultimately and finally return. It shall never, never die. Not a spark shall be quenched, nor shall a pulse cease to beat—not a thought that it has conceived, nor a desire it has cherished, nor a prayer it has breathed, nor a work it has accomplished, nor a victory it has won, shall die; all, all shall survive in ever-growing, ever-enduring glory. The babe in grace shall be there! The young man, strong in overcoming the wicked one, shall be there! The father, matured in experience, and laden with the golden fruits of age, shall be there! All, all shall reach heaven at last—the end and the consummation of the life of God in their souls. Oh, to have this heaven in our hearts now! Heaven is love—the place of love—the perfection of love. And what is God's love in our hearts but the foretaste of heaven—the foretaste of heaven—the first gatherings of the vintage—the pledge and earnest of all that is to come? Titus 1:16 (cf Lk 6:46, 2 Ti 2:19) A professed atheist—is a monster that we do not often meet with. But the more absurd and astonishing phenomenon of a practical atheist; one who is orthodox in principle—but an infidel in practice—we find wherever we turn! Titus 2:10 Living expositions of the truth! Titus 2:14 And WHY, dear Savior — tell me why? JOHN FLAVEL - "The Method of Grace"
Titus 2:10 Your duty is to adorn the gospel by your life. The words signify to deck or adorn the gospel, to make it attractive and lovely to the eyes of beholders. When there is a beautiful harmony and lovely proportion between Christ’s doctrine and our practice—then do we walk suitably to the Lord of glory. Titus 2:10 - Christ enjoined upon every one of His disciples to study Him, to learn of Him, and to imitate His example. A true Christian is the representative of Christ in this world — the only embodiment of gospel teaching and influences, that is presented in human society. How vitally important is it, then, that those of us who profess and call ourselves Christians, should make our Christianity attractive! Multitudes of people know very little and think very little about the Lord Jesus; nearly all the ideas they get of His religion — is what they see in those who profess it! An attractive Christian is the one who hits the most nearly that golden mean between love on the one hand — and firmness on the other hand. He is strict — but not censorious. He is sound — and yet sweet and mellow, as one who dwells much in the sunshine of Christ's countenance. He never incurs contempt by compromising with wrong — nor does he provoke others to dislike of him by doing right in a very harsh or hateful or bigoted fashion. Our Master is our model. What marvelous example of gentleness, forbearance, and unselfish love adorned His life! What He was — we, in our imperfect measure, should pray and strive after. Study Jesus, brethren. Get your souls saturated with His spirit. His grace imparted to you and His example imitated — can turn your deformity into beauty, and adorn your lives with those things which are true and honest and lovely. We must make our daily religion more winsome! Titus 2:11-15 "What The Gospel Is"
Martin Luther's insignia was a rose; in the rose a heart; in the heart a cross. The rose suggests fragrance and beauty — a Christian life should be beautiful, winning, attractive. It should be sweet, pouring forth the fragrance of holy love wherever it goes. The heart in the rose suggests that all true living for Christ is from the heart. But at the center of all was the cross. Until we have Christ, we can have neither fragrance nor beauty. We must never forget that nothing but the self-sacrificing love of Christ in our hearts can transform our lives. We sometimes sing, "Take the world, but give me Jesus" — but do we really mean it? It is a very sweet hymn, but do we mean it? Are we ready to have the prayer answered, fully, wholly — whatever it may cost? "It makes no difference what a man believes, or what doctrines he holds — it is only his conduct that counts." That is the way some people talk, as they sneer at Bible doctrines. But it does matter what one believes. Wrong believing leads to wrong living. The heathen worships a god conceived of as lustful, cruel, and unholy. The Christian worships a God, who is revealed as holy, righteous, pure, and good, and becomes holy, righteous, pure, and good. Beliefs shape our lives. It is important, therefore, that we know the truths about the character and will of Christ, as our conception of Christ will imprint itself upon our life. Titus 2:1-15 Don't Ever Forget Who You Are and Whose You Are! Titus 2:13 Looking For the Blessed Hope - Let us now contemplate the appropriate and spiritual posture in which it behooves all, and especially Christ's church, to be found in view of so glorious and near an event as the second coming of Jesus. For "behold the Lord comes, with ten thousand of his saints." Faith in the doctrine of a coming Savior is the basis of a holy posture of expectation. Without a belief of this truth, there can be no looking for this blessed hope. "When the Son of man comes, will He find faith"—in this doctrine—"on the earth?" No, it is to be feared that many in the church will be found sadly wanting here. They had believed in the coming of death, but they had not believed in the coming of Him who "abolished death." They had expected with trembling the "king of terror," but had not expected with joy the "King of glory." They had hoped to go to Christ, but they had not hoped that Christ would come to them. But the "glorious appearing" of Jesus, and not the death of the saints, is the "blessed hope" of the church of God. On this one grand event the eye of faith is bade to rest, as the pole-star of the soul, "until the day-star arise in your hearts." And how much more soothing to a believing mind is such an object of faith than the terrific monster—Death! To look up upon the "bright and morning Star," and not down in to the misty vault of the grave—to anticipate the glorious coming of the great Captain of my salvation, and not the gloomy and subtle approach—perhaps by slow and lingering steps—of the "last enemy of my being—to hope for the coming of the Conqueror, and not to live in dread expectation of the foe—surely is more strengthening to faith, animating to hope, and stimulating to love. Faith, thus firmly grasping the doctrine that reveals, will inspire the hope that expects the event. The child of God, first believing it, will then be found looking for it. Resembling the faithful and affectionate wife, who frequently retires to read over the letters of her long-absent and far-distant husband, lingering with especial interest and delight over the assurances of his certain and speedy return to her again, love will constrain you to dwell upon the promise—"I go to prepare a place for you. And if I go to prepare a place for you, I will come again and receive you unto myself; that where I am, you may be also." Thus a quickening power and holy exercise are given to these sister graces of the Spirit, faith, hope, and love. Faith believes it; hope expects it; love desires it. With this firm belief in the doctrine of the Lord's coming, the truth itself will be found an eminently influential one. Is it asked, of what practical use is this blessed hope to the church of God? We answer, "much every way." Chiefly in the emptiness and nothingness to which it reduces all worldly glory, and in the holy elevation which it gives the believer above all sublunary enjoyments. And is this no great attainment in holiness? The grand duty of the believer is to live above the world: he is not of the world, even as Christ was not of it. But we require powerful motives to influence us to this. We are moved by motive, and the religion of Jesus is preeminently a religion of motive. The certain and speedy coming of Christ to glorify His church, oh, what a motive is here! Were you to rise in the morning impressed with this truth, how sweetly would it carry you through the day!—how effectually would it dim the luster of the world's pomp, deaden its joys, soothe your sorrows, dry your tears, lighten your burdens, reconcile you to poverty, to crosses, to losses, yes, to whatever your Lord ordains! You would feel, "What have I do with the world's vanities, its smiles, and its glories? I am waiting, expecting, looking, hoping, praying, for that blessed hope, the appearing of my Redeemer." Oh, what an eminent Christian would you be! What a burning and shining light! What vigorous faith, what lively hope, what fervent love, what a holy living for God, for Christ, and for eternity, would henceforth distinguish you! Titus 3:1-8 What Does God Think Of Me? Titus 3:1-8 Remember … He Saved You! Titus 3:3 If God left us! Titus 3:5 Shun them as they would the plague! Titus 3:5-6 Not By Works of Righteousness - The conversion of a sinner to God is a convincing and precious evidence that Jesus is alive. In the regeneration wrought in the soul by the Holy Spirit, the life of Jesus is imparted. He breathes into the soul morally dead the breath of life, and it becomes a living soul. Until, in the exercise of His distinct office, this Divine Person of the adorable Trinity convinces of sin, quickens and brings the soul to Christ for acceptance, risen with Christ though that soul mystically is, it yet remains totally dead to, and insensible of, its great privilege—an utter stranger to that new life which springs from oneness with the "second Adam." The new nature which the Eternal Spirit now imparts is nothing less than the creation of the life of Christ in the soul; yes, even more than this, it is the bringing of Christ Himself into the soul to dwell there the "hope of glory" through time, and glory itself, through eternity. Here, then, is an evidence that Jesus is alive, to a renewed mind the most convincing and precious. Thus quickened by the Eternal Spirit, believers become temples of Christ. Jesus lives in them. "I in them." "Know you not that Christ is in you?" "Christ lives in me." "Christ in you the hope of glory." Thus every believer is a living witness that Jesus is alive, because he bears about with him the very life of Jesus. By the indwelling of the Spirit, and realized by faith, Christ abides in the believer, and the believer abides in Christ. "I in them, and you in me, that they may be made perfect in one; that they also may be one in us." We have already stated that this glorious entrance of Christ within the soul transpires at the period of the new birth. What, then, is every new conversion, every fresh trophy of redeeming grace, but a new manifestation to the universe of the life of Jesus? I see the sinner pursuing his mad career of folly, rebellion, and guilt. Suddenly he is arrested, I see him bowed to the earth, his heart broken with sorrow, his spirit crushed beneath the burden of sin. He smites upon his breast; acknowledges his transgression, confesses his iniquity, deplores it in the dust. Presently I see him lift his eye, and rest it upon a bleeding Savior; he gazes, wonders, believes, adores—is saved! By whom is this miracle of grace wrought?—The Spirit has descended to testify that Jesus is alive. That newly-converted soul, so lately dead in sins, but now quickened with Christ—that sinner but recently dwelling among the tombs, whom no human power could tame, now sitting at the feet of Jesus, clothed and in his right mind—demonstrates that Christ is in heaven, and is alive, for evermore. Oh, it is the heaven-descending life of Jesus. Show me, then, a soul just passed from death unto life, and I will show you an evidence that Jesus is alive at the right hand of God. Titus 1:2 Why Keep the Faith? Titus 2:6-15 Who Do They See? Titus 2:12 Are You Ready? Titus 2:13 Are You Looking Up? Titus 3 Good Deeds or The Cross? Titus 3:1-8 How Gentle are You? Titus 3:5 Good Deeds Or The Cross? Titus 3:8 A Perfect Fit. D Edmond Hiebert - Simpson, E. K., The Pastoral Epistles. Grand Rapids: Wm. B. Eerdmans Pub. Co. (1954). Greek text. Presents a robust defense of Pauline authorship. The notes on the text are designed to give an adequate understanding of the original message, reinforced by a wealth of classical learning. The novelty hunters are very numerous; like the Athenians they are always grasping for something new. But the greatest wonder in the world is the Bible. Its origin, teaching, and power are all superhuman. I. A Wonderful Exhibition. "The grace of God that brings salvation to all men has appeared." This is an exhibition of the grace of God. This means all the attributes of God, flowing out in order to save men. An exposition of the goodness of God. This is seen at the Cross of Calvary, in the Son of God's love, bleeding and dying for guilty men. The great "World's Fair" was only a heap of rubbish compared with this. II. A Wonderful Character. Jesus is here called "The Great God and our Savior." You may say Jesus Christ was only a man. Paul declares that He was the Great God. "His Name shall be called Wonderful—the Mighty God." What consolation is here for the Christian! Your Savior is the Great God—fear not. What encouragement is here for the anxious! The great God is a Savior— fear not to trust Him. What consternation is here for the self-righteous. You hope to save yourself, how fruitless your effort. It takes the Great God to save a soul. III. A Wonderful Gift. "He gave Himself for us." For a man to lay down his life for his friend is wonderful. This is man at his best. But while we were yet enemies, Christ died for us. This is Divine. This is the only example the history of the world has ever given us of one willingly dying for his own murderers. He gave Himself for you. What have you given for Him? Oh, you say, "I have no time." What, no time to thank your God for such a Gift. And your Savior's pleadings cease. IV. A Wonderful Work. The work of Christ as here stated was to redeem and to purify, to purchase and to cleanse. When a woman buys a set of china, she does not think them fit for use until they are washed. They are bought, then washed. The Lord uses us, not because we are great and gifted; not because we are clever, but because we are clean. It is not enough that we be redeemed. If God is to be glorified in us we must be cleansed. V. A Wonderful People. The redeemed and the purified are to be "a peculiar people." Some Christians are afraid of being peculiar, lest they should be talked about. They wish to mar the very works by which they ought to be known. Christians are a peculiar people. They have a peculiar citizenship. Their citizenship is in Heaven, because they have been born from above. Such a birth is not a thing to be ashamed of. They speak a peculiar language. The ungodly don't care about their conversation any more than for one speaking in a foreign tongue. VI. A Wonderful Life. The life of the redeemed man is to be a resisting life. "A denying of ungodliness." It is to be a sober life, not only a teetotal life. This is implied, but much more. Be sober in your eating, in your clothing, in your speech. It is to be a righteous life. The Christian should be the most punctual business man, the most trustworthy of all men. It is to be a godly life. A life beaming with the gentleness and truthfulness of Jesus, reflecting back on a dark world the image of the invisible God. It is to be an active life, "zealous of good works." VII. A Wonderful Prospect. "Looking for His glorious appearing." That the sun will rise tomorrow is not more certain than that Christ will come again. It may seem strange that He should say, "Behold, I come quickly," nineteen hundred years ago, and not to have come yet. But we must remember that 1000 years are with the Lord as but one day, so that two days have not yet passed according to His reckoning. He will come. Are you ready for His appearing? God grant that you may be prepared for that great day. It is easy to say that there is fullness of water in the ocean, fullness of wealth in the earth, and fullness of light in the sun; but can the richness of this fullness be reckoned up? So there is fullness of salvation in the grace of God, but that fullness can only be realized in the ages of the ages. In the above Scripture we see what might be termed seven steps into a full salvation. I. An Honest Confession. "We ourselves also were sometimes foolish, disobedient, deceived, and slaves of sin" (v. 3). Confession is the opening of the windows of the heart to the light of Heaven: an acknowledgment before God of our guilt and need of His mercy. God is faithful and just to forgive every sincere confessor (1 John 1:9). II. A Divine Revelation. Of the "kindness and love of God our Savior toward men" (v. 4). God's kindness and love, as revealed in Christ Jesus, is the greatest and most precious discovery any sinful man ever made. To him it is a fountain opened, where streams of mercy flow for all his sin and impurity. When seen and trusted, constraining him to make this other confession: "Herein is love, not that we loved God, but that He loved us, and sent His Son to be the atoning sacrifice for our sins" (1 John 4:9, 10). III. A Complete Justification. "Being justified by His grace" (v. 7). As we have sinned against God, God alone can justify. This He does by His own free, unmerited favor, through Jesus Christ. "It is not by works, lest any man should boast" (Galatians 2:16). When God justifies the believer in Jesus it is an evidence that his forgiveness has been full and complete. IV. An Entire Regeneration. "He saved us by the washing of regeneration" (v. 5). Suppose it were possible to be justified from all sin, and yet not be changed in heart, or made a new creature How soon this justified one would be like the sow that was washed returning again to the mire. "Whom God justified, them He also glorified" (Romans 8:30). Justification sets us right with God for further blessing. Regeneration makes us like God in character for holy service. It would not be a full salvation without being "born from above." V. A Daily Renovation. To meet this need there is "the renewing of the Holy Spirit which He shed on us abundantly" (vv. 5, 6). This is the Divine remedy for spiritual staleness. "Be renewed in the spirit of your mind" (Ephesians 4:23). Along life's rough path there is much to tear and wear the energy of the soul; but the Holy Spirit can renew our freshness and fitness by His quickening influence. "It is the Spirit that quickens." Here the flesh profits nothing. Where the Spirit of the Lord is, there is liberty. Our Lord said: "He that believes on Me out of his inner man shall flow rivers of living water: this spoke He of the Spirit" (John 7:37). "Believe and you shall see." VI. An Eternal Possession. "Made heirs of the life of the ages" (v. 7). Our Heavenly Father has such vast possessions that every child "born of God" becomes an heir—not merely of eternal existence, that is seen, without being "born again;" but of the abundant life that is in Jesus Christ, throughout all the coming ages. Thus we have fullness of mercy to begin with, fullness of grace to continue in, and at last fullness of life to glory in through all eternity. "He who has the Son has life" (1 John 5:11). "He is able to save to the uttermost." Paradoxically "Third Millennium" has an amillennial perspective. These are the old notes. The Apostles: Can There Be Apostles Today?